It’s school holidays here at present and I haven’t taken the whole two weeks off. In fact I’ve not taken any time off except for yesterday which meant, with Easter, I had two – four day weekends. I used to only work three days a week and it’s much more civilised than working a four day week which is what I presently do. It allows time to do those chores around the house that probably normally wouldn’t get done. Therefore yesterday morning saw me out in the little front yard we have sweeping the little front porch. I realised I’ve never ever washed the stained glass window next to my door which I still didn’t do yesterday but I’ve put it on my mental to-do list along with painting my bedroom door which has been waiting five years for me to do. Yesterday was also the day to head into the city to buy JJ’s scout uniform. As I forked out for the shirt, scarf and hat I told him that he was staying with Scouts. None of this I’m bored with it after ten minutes. Before we even got to the scout shop we walked past a shoe store. This one had a sales rack out the front and I can never walk past a sales rack. I found this pair of Birkenstocks and it was the only pair like it and it was in my size. So I bought them. Nevermind that we’re moving into winter here, I’ll still have them when it gets warmer and they were too much of a bargain to pass up. Actually it’s been an expensive weekend. My vacuum cleaner finally died this weekend and it pretty much worked out that it was just as economical to buy a new one, so I did. JJ’s boots are on their last legs so I bought him a new pair. I stocked up on tights, undies, singlets and a pair of tracksuit pants for the coming winter. As mentioned I bought the scout uniform and the Birkenstocks. My credit card will be staying in my wallet for a while. After our shopping expedition yesterday we walked down to Cold Rock and bought an icecream. 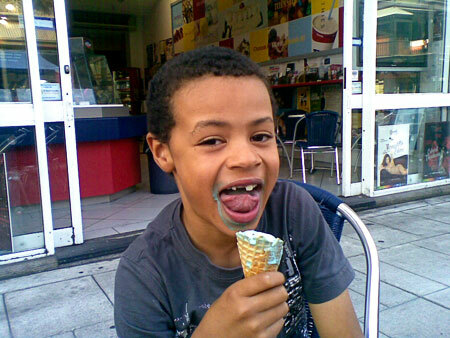 JJ had a bubblegum flavour with freckles mashed in. I had rum and raisin and boysenberry with nothing mashed in. I’ve had one person do my Blogging quest with some others saying they’ll do it. I’d love it if you do it too. Heh, I love Cold Rock. I love photos of kids with ice cream all over too! Caramaena – Cold Rock is yummy isn’t it? I had to wipe his mouth quite a bit afterwards. I needed a wet wipe but I don’t carry them any more. Jayne, only just. Those cold nights are creeping their way in, but it was a beautiful autumn day the other day. It couldn’t have been more perfect. I love ’em. Oh he’s gorgeous! Love the sandals, too. I am going to get to work on my blog quest, I’m not sure what happened but it’s been an extraordinarily busy week. Great shoes and a great find, I am like you, can’t walk past a sale rack! (Actually I can’t walk at all today, but that’s a different story). Welcome to the world of scouting! love the Birks! We have had some glorious autumn days too – today not on of them though as it is raining! Rhubarb – sorry to hear you can’t walk today. Hope you can walk tomorrow! Yes, the world of scouting. It’s not just him who’s joined – it’s me too. Planning Queen – it’s been raining here too since last night. It’s very welcome indeed. Looks like JJ is really enjoying that ice cream cone. I’ve had bubblegum before….YUM. New boots, new clothes, new uniform, new shoes, and ice cream…yep, pretty good day.